MP ships International orders daily – Canada, Mexico, Puerto Rico, Hawaii, Alaska, Europe, etc! Just a reminder for those of you outside the USA. For your Neon, Neon SRT-4, Caliber SRT-4, Cobalt parts needs, MP can surely help you. Our website is designed to easily quote you shipping costs for packages, and we have a employee who does nothing but handles our international orders. That way you can get your order as fast as possible, with no delays. Our international shipping employee knows what forms are neccesary to get your package there with no customs delays as well, so theres no suprises, delays, etc. 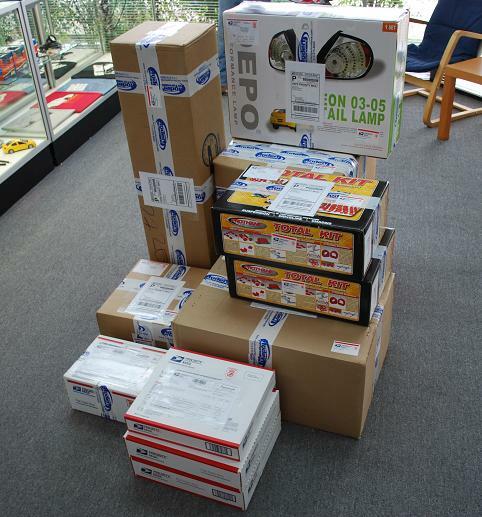 Heres a picture of a pile of packages our US Postal clerk picks up from us on an average day. In this pile we have packages going by US Postal Service to Canada, APO/FPO, Puerto Rico, Hawaii, and even parts of Europe. This is not a special occasion, we ship daily outside the USA!